We are with friends for the New Year and staying in, eating and drinking lots! My friend and I decided to get dressed up (slightly) even though we weren't going anywhere. However I suspect that shortly after dinner we will put our PJ's on and chill out! I have put the skirt with the same top that I wore on Christmas Eve (Hobbs jumper) opaque tights, shoe boots, H&M ring, Stella & Dot bracelet. Sometimes it's good to see things in a photo - I was slightly concerned that the "bell" aspect of the skirt was going to be too bell like for my liking but I think that it is just about OK.
Hope that you all have a fabulous New Year's Eve! See you next year. One lady, unable to see the price of an item due to the totally and utter rubbish (my words not hers) lighting in there took an item to an assistant to ask what the price was. The assistant couldn't find the price either. When asked why the store had such inadequate lighting the assistant said that it "added to the ambience". I like it! Another lady, having picked up an item, had to go and check out the nearest lightbulb to find the price, where she met other customers doing the same thing. Another lady went in with some information about a sweatshirt that she wanted for her daughter. She took details of the sweatshirt, what it said on the front etc but was told that without the code they couldn't trace it. Top service! Mary Portas would love that one! Another lady went in with her elderly mother who has a condition which means that she has difficulty seeing in certain light. She couldn't see her daughter which caused her to panic and because she couldn't see, she then tripped over a rug. Now whilst some of the above are vaguely amusing, this isn't in the slightest. Have they never heard of Occupier's Liability for Dangerous Premises or all of the Health and Safety Legislation? I know I know - I sound as if I am ranting and really it's not that bad. My friend and I have decided that it's the messing about with our senses that we can't deal with. You know that whole school disco thing of no light, lots of sound and the smell of sweaty bodies was fine at the age of 14 but now - being starved of light whilst at the same time our auditory and olfactory senses are overloaded (I was told that they pumped the smell of their fragrances through some system in their stores) means that we get dis-orientated. It's an interesting concept really isn't it? Employing methods that are used to torture people to sell clothes? But somehow it works. I am still struggling with it! Mum on the Run - the Twelve Days of Christmas - A Mango lace skirt and biker boots plus a guest on the blog! Today I worked backwards and decided on the footwear first, (biker boots- on the basis that we might be going for a walk) and then fitted the clothes around the boots. I chose this Mango lace skirt because it's comfortable and put it with an H&M striped long sleeved top and Oasis striped jumper to make it less dressy. My Reiss pea coat and humungous leopard furry gloves completed the outfit when it was time to head out. My friend Sal dropped round today and kindly agreed to be photographed. She had on a lovely printed jumper dress which looked as though it was from Jigsaw but which she in fact bought from Sainsbury's for less than £10 - (in fact it was nearly free after she used various discount vouchers - a real bargain if ever there was one!) She put it with a Jigsaw cardi, leggings and Dune boots. She had done a great job of lifting an inexpensive item by mixing it with a more expensive piece. I thought that her hat was from Jigsaw too but apparently that was also a fab bargain. Having short hair I can't really do the whole woolly hat thing but I think that Sal looks great. Mum on the Run - The twelve days of Christmas - a bit of a Cos day! I have found a brilliant way to get a new wardrobe for yourself - sort through your ironing pile. It worked for me! I reckon that I could do a whole week of posts based on what was lurking in the ironing cupboard. The above Cos shirt dress was one such item. In fact I knew that was there but I had totally forgotten about two pairs of trousers and a couple of tops that had been languishing there since I last ironed (circa 1995). The three muskerhounds and I went off to visit a school friend of mine this morning, which was followed by a trip to see my Mum. All went well - no ornaments broken, no-one offended, no-one wet themselves or puked anywhere and strangely there was no fighting. Yes, I behaved rather well today I thought. Given that we were up and out by 8.30am I had to make a quick decision on what to wear. I wasn't sure whether the grey Cos jeans would really work with the navy shirt dress but in the end it was fine. I put a striped Gap top underneath the shirt dress and a chunky Oasis cardi over the top together with a Reiss belt and the shoe boots - which have been my saviour (why does that word always remind me of Cliff Richard?) this holiday. I quite like the shirt dress over trousers combo - it makes me feel kind of dressed up without feeling like I am wearing a dress - if that makes sense! I love the way we women have all these psychological things going on in our heads in relation to clothes. Just so that you know, the John Lewis website is not up to speed with what is going on in store and some items which are discounted in store aren't discounted online. However, I found that if you call customer services, you can buy the item at the full price and they will immediately refund the difference. A bit of a faff I know but it's worth it if there's something that you particularly like but which isn't in store in your size. Anyway, as to the outfit. I haven't worn a skirt for a while and the red shoes deserved a festive outing so I put them together and worked in some pinks and purples as well - none of which "matched" but given the neutral background it didn't matter. Quite often my clients are nervous or reluctant to put things together which, in their eyes, don't match and I encourage them to have a play around. As long as the background is fairly simple - black/navy/grey/beige it's good to mix the accent colours and frankly no-one notices anyway! Mixing it up a bit makes for a much more versatile wardrobe. Remember how a few days ago I featured the silver sparkly party shoes by the "shoe tree"? Well, I have now reached the stage where the heels have been replaced by sheepskin boots - and oh how nice they feel! Anyway, the above aren't Uggs at all - they are from mini Boden and even better they were in the sale. The first pair which I bought last year for our daughter - on account of the fact that I wouldn't want "mini boden" across the back of my ankle but which I then proceeded to wear on a regular basis - are now a little worn. The fact that they go up to a size 6 is great and I love the colour too. Predictably the tan ones are sold out but they still have the blackberry and raspberry colours in stock. I am not proud of it but today I had a fight with a three year old over a can of coke, putting dents in it in the process (the can that is, not the child). There we were, playing monopoly after lunch and my three year old nephew came and swiped my can from under my nose, ran off with it and started drinking it. I hot footed it to where he was where we wrestled over the can for a while before he gave up, looking at me in the process as if I was a complete and utter idiot. On reflection I can't say that I blame him. So, given that we were visiting family and I knew that there was little chance of us making it out of the front door once we had arrived - although I did pack sensible shoes just in case - I thought that the silver party shoes deserved another airing -as did the party trousers. I put them with a TopShop blouse, Boden cashmere cropped cardigan and a TopShop necklace. I don't really like the feel of the blouse against my skin and so what I do is layer a very thin cotton top from H&M underneath. It doesn't add bulk but it does just make it feel that bit nicer and it means that I am more likely to wear it than otherwise. I should just say thank you to the lady who let me know that she likes my PJ's above any other outfit - I will remember that next time I am unsure of what to wear! Mum on the Run - the 12 days of Christmas - Christmas Day outfit 2! So there we have it - just gone 5pm and I am in one of my Christmas presents - which also happen to be one of the most unflattering garments known to man (or women) - PJ's. It's not really an outfit, rather a state of undress! These are Cath Kidston ones and a present from my hubbie. I am so relieved to be in them - I can now snuggle up on the settee, watch TV, play games and just chill out. I chose them as the print reminded me of a fabric that my Grandma had in her bedroom when I was little - her curtains, covering her bin, the skirt round her kidney shaped dressing table, the fabric on the cushion of the dressing table stool - and when that was replaced the fabric was recycled into pinnies -and so it went on. Enjoy the rest of your day! x I hope that you too are comfortable and cosy! Mum on the Run - the 12 days of Christmas - Christmas Day! At last! It's here - Christmas Day. As I watch Top of the Pops I now feel quite Christmassy - unlike at 3.30am, 4.10am and 5.20am which is when our son came in to tell us that he couldn't sleep. Apparently the words "bugger" and "off" featured in my vocabulary - hardly full of Christmas spirit was I?!! This was the dress that was bought to fulfill many functions this Christmas and it is doing its job well - fulfilling the criteria of being able to be layered (there's a vest, slip and long sleeved top under this baby, which is necessary as I can't get a cardi over the top due to the shape of the sleeves) and loosened. The print hides the things that I have already spilled down it and it is long enough for me to crawl around on the floor without scaring the nation. The photo below shows the sleeves off in all their Christmas glory! The dress is from Great Plains and I put it with some black opaques and Hobbs NW3 lace up shoes in purple. Mum on the Run - the 12 days of Christmas: Christmas Eve outfit! I started off the day with a run with friends - it was hard work but worth it and on the way home I nipped via M&S just to take a look at the queues (sadly, they weren't very long) and to see whether they had any cookies to sample as by then I was in need of sustenance. How scuzzy is that? There were various possibilities for the day ahead including the cinema, dinner out and going round to see friends - so I wanted something to cover all eventualities. At the moment I am opting for clothes that can be layered and/or loosened as necessary! So, I wore a black metallic Jigsaw dress with a black Hobbs '50's style jumper underneath, M&S grape coloured tights, leopard belt, lots of cuffs/bracelets and shoe boots (again)! The length of the dress is good for me and there is a fullness to the skirt which works well. Have a lovely Christmas Eve - how exciting! So what is it about Christmas that brings out the nesting instinct in women, similar to when we have our babies? In that case it is more understandable that we want the house to be ship shape as it is quite possible that another five years will go by before we get back on top of the game. But with Christmas. Did I really need to handwash all my "woollies" (as my Grandma called them) in time for the BIG day, or polish all of my boots or wash all of the towels. Nope. Not at all. But I did anyway. Anyway, enough of that! Last night we went round to our friends' house for dinner. Whilst I didn't want to be too OTT I wanted to feel a bit more dressed up than just jeans. So I opted for Topshop navy peg trousers, Oasis sparkly top, H&M fur coat, stella & Dot necklace and shoe boots (which I have recently dug out of hibernation and I am so glad that I have. They cost me £17 from F&F at Tesco a few years ago and are perfect for now)! So, anyway, after the trip to the cinema yesterday, it just so happened that I found myself in Birmingham with an hour to spare whilst our daughter and her friend did a bit of shopping. What a lucky break! I thought it only right that I check out the Reiss sale, which I did, thoroughly. The one item that I really liked, and which I have had my eye on for a while was this fluffy feather gillet in oil blue (although I tried it on, I have to admit that I gave the hotpants a wide berth - see below). The fact that it is made out of turkey feathers was not lost on me. Also, the fact that it had been hugely in demand because one of the girls from TOWIE had been seen in it put me off slightly. Now I really don't like to be judgmental, stereotypical etc but is that not enough to damage the street cred of any brand? It's a bit like my husband wearing a Jack Wills hoodie - which he keeps threatening to do. (Just watch those share prices tumble!) So it stayed on the hanger which was probably just as well because shortly afterwards I saw a lady with a very orange face wearing one. Now that my husband has finished at work, Christmas can really begin for us so I am going to do a feature, somewhat inspirationally (!) entitled, "the 12 days of Christmas". Each day I will show you what I am wearing over the Christmas period, to include outfits for trips to family, to friends and staying at home. Have you read those articles about how, if people aren't really doing anything much at all, they make it all up to look as if they are uber busy or uber popular and post fake tweets and photos on facebook? Well, there won't be any of that going on - if we're a Billy no mates family for a few days that's fine by me! Due to the unseasonally warm temperatures, the wardrobe possibilities have opened up a little, so it's no longer all about thermal vests and the heaviest jumpers I can find. I can even get away without wearing socks - steady on now! So, today for our trip to see Arthur Christmas - (don't I know how to show the family a good time) I have opted for skinny jeans, sparkly jumper and shoe boots with a spotty scarf. I have taken account of the fact that we won't have to walk too far, so heels can be worn. Yippeee! You might notice that over the next 12 days the skinny jeans get replaced by slightly looser clothes! Don't you remember how, as a child, the bread that you took to feed to the ducks was always so much more appetising than the bread that you had at home - however out of date it may have been? I was reminded of this today when we discovered the chief refuser of food (our youngest) happily sitting on the bench munching a slice of wholemeal bread (not mouldy, fortunately) whereas normally she would turn her nose up at it. It also amazed me how all three children were equally desperate to throw the first slice of bread to the ducks, despite their varying ages of 12, 10 and 3. I had a major trauma today in that I couldn't find my husband's Christmas present. There I was on the phone to John Lewis asking them to check that it hadn't been left in the store etc etc and then, having raided all of my usual hiding spots, I had a flash of inspiration and found it in our son's room. Really, I should have just rung my husband (chief snooper extraodinaire) at work and asked him where it was as no doubt he knows - but he was busy fearing for his safety at a court hearing so I decided to leave him be. Anyway, as to the clothes for the day - it wasn't cold outside so I thought that it would be nice to get away without a coat. I layered up my black Jigsaw Jersey dress with a Gap snood and a chunky knit from Oasis and just added a turquoise belt and pink gloves for colour. Later on the ballet pumps were swapped for biker boots so I could keep up with the three musketeers when they were out on bikes and as for the belt - that got discarded somewhere around mid-day when the youngest decided to take it off and put it it round her neck. Mum on the Run - Time for a Party! It was party time at our house last night. A few girlfriends, some fizz and a lot of chatter! The Zara trousers had their first outing and they were - well, just black trousers really but given that the lighting represented a Hollister shop it wasn't suprising that the jacquard leopard print remained hidden. I really like the length and the fit and am looking forward to wearing them in daylight. I wore a Topshop top that I have had for a while as I couldn't find anything else that I loved enough to spend money on it. I also wore a new black sparkly belt from Coast. These were the shoes that I wore for the evening. I liked the style of them - they are a real change from the chunky high platforms that have dominated the shoe scene for a long time. I haven't worn heels this thin, or this pointed, for a long time, if ever in fact but the shoes were surprisingly comfortable (and very sparkly too)! They are available from Dune and currently in the sale. Below is a photo of the party scene, pre-guests! I feel that at last we are starting to get into the mood of Christmas. Hope you are too! Mum on the Run - A chapel service (or two)! Yesterday my Mum and I attended two carol services at school. I thought given that it was Christmas I ought to dig out my churchgoing type of gear so on went the Hobbs boughts (at least 13 years old now) a very traditional Jigsaw coat, H&M navy leather gloves and a new bag. I kept it modern with a leopard print scarf. Actually that's a complete lie - it was just the nearest one to hand and I thought that chapel might be chilly. On seeing the bag my son said "Oh Mum, you've got a new Mulberry." Well identified I thought for a ten year old boy - other than the fact that it was £5 from Primark! It's great - just the right size for keys, phone, money and of course - tissues. I am definitely turning into my Mum. I can no longer watch the children do anything without crying!! It's all downhill from here! I am on a mission and that mission is to buy something from Hollister - a gift card in fact for a Christmas present. You would think that it would be easy - it being a shop and all that, whose main aim, one might assume, would be to sell to the public. Apparently not. Attempt number one saw me going into the store. The first thing that struck me was how dark it was. I thought that having a shop which was so dark that you couldn't actually see what was being sold was an interesting concept. Still, I am prepared to accept that I am old fashioned like that and the stores that spend a fortune on fancy lighting are missing a trick - and at least they were being environmentally friendly. The till, I was told, was upstairs. So up I went. Now, I am pretty healthy but by the time that I got to the top I was able to breathe a bit less easily than when I was at the bottom. There I found three tills, one shop assistant and about 533 people in the queue. Being British I don't mind a bit of a queue - in fact if you grew up near my local chippie, you got pretty used to queing on a Friday night - but that was ridiculous. So off I went. Apparently the fact that it had been a busy weekend meant that most of the staff were too tired to turn up for work but enforcements were on their way. Jolly Good. Attempt number two saw me return to the same store, go up the same stairs to the same tills. "Aha" I thought, "my luck is in". This time there was no one queing but that was probably just as well because they had run out of Gift Cards. How can a store run out of Gift Cards in the run up to Christmas? Anyway, there it was. So off I went (again) - stopping to speak to the Manager on the way to point out to her, politely of course, that running out of Gift Cards at Christmas probably wasn't the best PR/marketing policy ever invented. Trip number three saw me literally do that - trip over a leather pouffe thing which was placed in front of a leather chair which was presumably there for customers to take a rest in when they could only get one member of staff to serve the queue of 533 people. My friend and I did see the funny side of it but that, combined with the hideously loud music (not so environmentally friendly after all so let's untick that box), lack of lighting, lengthy queue and general irritation that I already feel on just seeing the signage meant that I left for a third time WITHOUT A GIFT VOUCHER! Mum on the Run - party trousers - a decision made! And so I have made a decision on which trousers to wear to my party. The Asos pair were discounted immediately on account of their high waist, stiff material and the fact that they finished at a less than flattering length. The composition of the two wasn't dis-similar, although the Jigsaw ones are dry clean only and the Zara ones can be washed. In terms of the print, both are very subtle as they are black on black. The Jigsaw ones clearly weren't the same pair as the ones I had tried on earlier in the week - either that or I had put on half a stone in a few days, because they were very snug! So anyway, the Zara ones won. The price was great and they just have that added flexibility that I need at the moment both literally in that I can move in them more easily and also because I won't mind if a small one heads to me at a vast rate of knots with sticky fingers as I know that they can be stuffed in the washing machine. I still love Jigsaw all the same though! I definitely think that there is room for a pair of printed trousers in my wardrobe - they just need to be subtle, which these are. They are a good shape for lots of ladies - tailored but slim and unless you really need a wider leg to balance out your hips, they could be a winner! Mum on the Run - What to wear to your own party?! The thing is, I have decided to have a party. It's probably not a wise thing to announce on a blog but I doubt that hordes of people are going to turn up and do something outrageous like, I don't know, snap my orchids or blow out the White Company candles. Plans are going well so far - really well. I have five toblerones and six packets of Wotsits - the trouble is that I keep on eating the toblerone so I won't even have much of that left by the time the party arrives but at least the Wotsits will be intact - I think. Not that anyone will want to eat them. Apart from me that is. So, what to wear? Well I put on the invitation that everyone should be comfortable and that thermals and elasticated waists were permitted. People might think that I am joking but I am deadly serious. Another reason for liking the dress that I featured yesterday was that I can wear my thermals underneath it without anyone knowing. I am currently sitting here in my sweat pants with an elasticated waist so comfort is important! 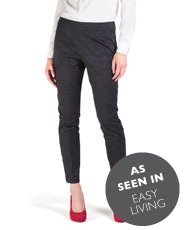 Asos trousers as featured in this month's Red magazine. I have to say that they weren't all that they promised to be. At £30 they were £20 less than as quoted in Red (not to say that Red got it wrong) which was a plus but the fabric was stiff and they are uber high waisted, which isn't always necessarily that flattering or that comfortable. They were also too short on me - finishing at an unflattering length. So they are a no. This pair of black jaquard trousers from Jigsaw which have a flower jacquard print. At £115 they are a tad on the expensive side but they are amazing and look lovely. The flat front and side zip is very flattering....I can feel a dilemma coming on. The third pair are these ones from Zara which feature more of a leopard jacquard print. At £25.99 they are a great price and are currently in my kitchen waiting for me to try them on. However the huge stew and endless pieces of toblerone are preventing me from doing anything this evening, other than slobbing on the settee in front of the TV - so that joy (or not) will have to wait until tomorrow. I will report back tomorrow when I will have to make a decision - although if I decide on the Jigsaw ones, I will probably lie anyway. The next dilemma will be the shoe one - and then the top one. In fact I will probably run out of days to complete my outfit before the party so my track pants, complete with elasticated waist, and my thermal top will reign supreme. Now, as to whether the thermal should be cream or black - oh crikey, I can feel another dileamma coming on! This is the dress that is going to work hard for me over Christmas - really hard! It has already done a party at a friend's house, the ballet, a Mum's night out and a meeting today. Given that I only bought it on Monday it's doing fairly well for itself - and it has still got two carol services to go. The cost per wear of this little baby is going to be minimal! it has a slip underneath for added warmth - all of the above make it easy to wear - I can bend over without startling anyone in my company, reach up without flashing my knickers - you get my drift! It was from Great Plains and wasn't too expensive. Great Plains is definitely worth taking a look at - they have some nice pieces at a good price and the mail order service is good. Here's a link to it http://www.greatplains.co.uk/index.aspx?mscsmigrated=true. By the way, it appears that there is now a sale on so if you see my dress at half price, please don't tell me. Some don't like the look of cropped trousers - and I kind of get that. It can look as though your trousers are a bit short but I got over that years ago when colleagues teased me about some cropped trousers I was wearing. I like them and think that they can be really flattering - even if you are on the petite side - in fact especially if you are on the petite side - provided that they finish at the right place. I was styling all day today so needed to be comfortable - hence the pink pumps with the Queen Mother heel! I put the trousers with a Cos jumper, Boden jacket and pink Marks and Spencer leather gloves and I was good to go. I was also good to come home and take the trousers off by the end - let's just say that whilst comfortable, they are fairly snug! I thought that it was jolly nice of Louis Vuitton to include pinks in their window displays. In real life, the colours are much closer to my coat than they look. I also thought that it was good of them to make sure that the shop was closed as I was passing - just so I couldn't be tempted. I have a theory that people like to see bright colours on others, even if they would rather not wear them themselves. A bright coat, shoes or bag will always elicit a chirpy comment - even if it is along the lines of "you know what they say about women who wear red shoes!" This year I have had lots of people ask me where I got my pink coat from. The reason that I say "this year" is because my coat must be at least 5 years old now - if not more - and it was from Benetton. I have found some alternatives on the high street, should you be tempted to replace your black coat with a pink one (go on, I dare you! It goes with black, navy and grey and makes a nice change). 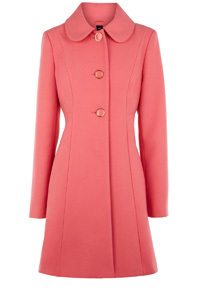 So, as for my chosen coats, they are all pink but all diffent in their styling ranging from a fairly smart work coat, to a very simple streamlined on trend shape, to a sweet 1960's style coat. The first one is from Jigsaw and costs £249, however, Jigsaw is holding a 10% sale on Thursday so if you do like it, you might want to wait until then. Although it is double breasted, so in theory less suited to ladies with a fuller bust, the two rows of buttons are quite close together so it is actually more flattering than some designs and looks less like you have targets on your chest! 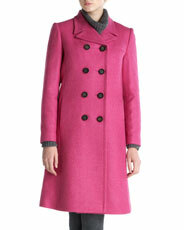 The second coat is from Jaeger Boutique - it is currently in the sale with 50% off and costs £199. I quite like this design - it's very simple, slightly cocoon shape so very up to date and slightly more casual than the Jigsaw one. The third coat is from Oasis and costs £65 but look out for offers. It's called "Dolly" which pefectly describes the shape - 60's, girlie and very pretty. Having had three children, all sense of self respect of dignity left me years ago, which is why I am not afraid to show you this photo of myself grinning like an idiot whilst standing like a flamingo. Having taken the photo my son said "that's fine Mum - you don't need to take any more". I should have realised that his desire to get to WH Smith to add to his collection of force attack Star Wars cards far outweighed any obligation to me to stop me from looking a total geek. So there we have it! Anyway, today I gave my Kate Moss for Topshop dress its first winter outing. It must be well into its third year now but I still really like wearing it as it is just the right side of flippy/pretty without being too girly. I stuck my cable knit from Warehouse over it and teamed it with M&S tights and Hobbs biker boots. I noticed the other day that the jumper also comes in grey. Whilst it's not everyone's cup of tea and won't suit all bodyshapes, I have to say that it is doing me proud so far! Mum on the Run - Fabulous totes! 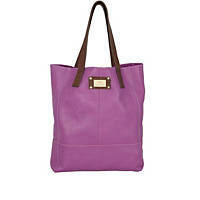 As we all know, totes are huge (excuse the pun) this season and the Zara tote has had massive press coverage. 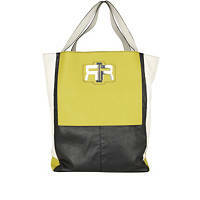 However I also love these totes from River Island - which I spotted this morning. The purple and orange ones are great for lifting those darker winter colours. There are great neutrals in the silver and gold and great colour combos in the green above (there are others too). At £60 ish they are a good price for a large leather bag and the practicality of having something that you can throw your possessions into and go, holds great appeal. 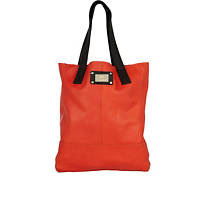 I love the orange one as it goes so well with navy (which I wear alot) and thanks to Victoria Beckham, there is going to be lots of navy and orange around next season. My only tip - I would put a small cloth bag inside - such as a dust bag for shoes - to protect it and make transferring your belongings to a next bag much easier. Enjoy! Today I was running a style event for a group of ladies at a firm of solicitors. It was great fun - they were a lovely group and the event seemed to do what it was designed to do - get ladies chatting. OK, so it may have been about shoes and the like but there was definitely a good buzz and as was noted - it was more interesting than a golf/racing/motor racing outing! I wore my navy Cos dress (the gold band around the middle is a zip but fortunately the dress doesn't unzip into two halves) and LK Bennett Sledge shoes. Today saw a combination of clothes old and new - a Zara skirt from last year, Gap striped top, this season's Warehouse jumper and a new Oasis scarf to pull it all together. I dug the pink pied a terre shoes out yesterday when continuing with my clear out - they are probably 7 or 8 years old but I still love them. They are a bit retro with a "Queen Mother" kind of heel! I quite liked the colour palette and the combination of the very casual jumper with the slightly smarter skirt/scarf. Most of all though I was warm and comfortable! My husband was at a conference today so I wisely (!) headed into town with the three musketeers for a bit of Christmas shopping and a look around. They each chose a decoration for the tree, behaved nicely in a cafe and I only lost two of them - pretty good going I thought. Each time the little one asked for something I suggested that she add it to the Christmas list that we would make on returning home. Hopefully she has forgotten the majority of the 325, 000 things she asked for or else it will be a very long list. Having visted a friend in London earlier in the week who has the most immaculate house you could ever imagine, I have attacked our cupboards with gusto. Virtually everything in the house is at risk of being disposed of. Anyway, I came to sort out the 500 plus set of instructions for all manner of toys, electrical gadgets and appliances we have had over the years. I found that a not insignificant number of instructions belonged to items that have been stolen. I am tempted to put them in a plastic wallet, label them up and leave them in the shed for the next time that the thieves visit so that they can at least be certain that the lawn mower is working to the best of its ability and doesn't need a service. I also found a neat diagram of how to load the dishwasher properly. Having been asked by my husband whether I was any good at jigsaws as a child, on account of the fact that (he thinks) I can't load the dishwasher properly, I am going to tape it to the front of the dishwasher and follow it closely - because obviously I have nothing better to do with my time. So anyway, the outfit was just a bit of a chuck together really - Warehouse printed shirt, Boden coral jumper over the top, Warehouse skinny jeans, Clarks pumps and Jigsaw cape. I preferred it later on when I swapped the jeans for wider ones and the shoes for my red shiny loafers. I felt a bit more "balanced" and the proportions were better. Mum on the Run - A bright pink coat! Ah bless her - the three year old has been put in charge of the camera again as the rest had gone off to school/work before us - this was the only shot that I could use as the rest were blurred. I have this amazing ability to have my eyes shut on many photographs - the odds of it are meant to be minimal but I seem to manage it. Shame that I can't beat the odds of winning the Euro millions - but then I wouldn't be posting picture of me wearing a bright pink coat which I was going to give to a charity shop but which I decided to keep and now love. No, instead I would be sunning myself on a yacht in a bikini and trust me, that would not be a pretty sight. So instead, here I am on a cold November morning ready for another day in the shops. I resorted to flat boots and skinny jeans but tried to lift it with an Oasis sparkly top, a piece of my Stella & Dot jewellery and a bright coat. It all reflected rather nicely on my nose - currently a similar shade of pink to my coat as a result of a cold. Mum on the Run - A skirt - and an acid yellow one at that! ....also carrying on the theme of bright clothes, today I wore a bright yellow skirt from Cos. It's wool, slightly A-line and the kind of colour that I would wear on my bottom half but not my top and only if everything else was plain - in this case navy. I did feel a bit conspicuous to start with but I soon got used to it. I went for a bit of a preppy look with loafers, a pea coat and a navy sparkly jumper from Warehouse. As you can see, I really was "on the Run" in this photo - trying to get 7 of us out of the house but failing. Our son was talking to me out of our bedroom window at this point, hence the glance skywards! Carrying on with the jumpers/cardi theme, last week I bought this cardigan from Whistles. It's nothing to be proud of - it was in the sale so I don't suppose that many people really liked it but I did. It reminded me of a cardi that my Great Auntie Vi knitted for me when I was at school and being a sucker for anything a)warm and b)coral coloured I knew that it was going to end up in my wardrobe! I have styled it both with a navy lace skirt and a leopard print belt and then as above -Cos skinny jeans, Cos boots, long Jigsaw top and Oasis scarf. I was so hot that I had to take it off later in the day - definitely a winner in my book! Mum on the Run - jumpers are where it's at - especially if they are striped! I think that you can tell that a small person was involved in taking this shot from the way that I am looking down. It also explains the fact that the top of my head is missing - but at three, said small person does very well - and this blog was always meant to be a family endeavour! This was our first scootering trip out this week as our youngest has had chicken pox. As usual, I needed to be fairly hands free - it's just safer for everyone and in particular the local population - hence the cross body bag from Cath Kidston. I was styling a lady this morning for her daughter's wedding so on returning home I chucked off the smart stuff and grabbed the closest casual clothes - which just happened to be Gap straight jeans, H&M striped top with an Oasis striped jumper over the top and a Boden jacket with a Peter Pan collar which is of the moment now but probably wasn't when I bought it two years ago - I just liked it though! The boots are from Jones and just happened to be nearest to the front door (they are still a bit muddy from when our 12 year old borrowed them to go to a bonfire.) She's after my LK Bennett shoes at the moment and I have told her no flippin' way. I had to wait 40 years for them so she's not getting her mitts on them! Having promised to get my act together and blog more I have actually failed miserably this week. However I managed to get my son to take this photo of me today sporting my new cable knit jumper. Anyhow, whether jumpers are "this season" or "in" I don't really care because the main thing is that a good chunky one will keep you warm and for now at least, they are in plentiful supply. To be ultra on trend I should have put it with a skirt but that's just too try hard for the school holidays. This one is from Warehouse and has a good wool content to it (many don't). Cos also has a great jumper with a funnel neck and which has grey and yellow in it -sounds bizarre I know but I love it. Topshop has one with an alsatian on it, Cath Kidston a Westie and Joules, ducks! Loafers - you might have already been there before in the 90's and now think "no way" but let me try and persuade you. They are flat and comfortable, smart and a change from ballet flats. They look great with jeans and slim cropped trousers and give a preppy feel. If brogues aren't for you, these might be. They too are from M&S and cost £45. Not too bad if you aren't sure whether you want to make a big financial commitment to them. Jigsaw also has some nice ones. Yesterday I was running two sessions at a day long workshop in Birmingham. In my first session I concentrated on smart/casual clothes, covering 10 key pieces for the season (plus accessories). For each of the 10 key pieces I offered a timeless classic and a couple of alternative more on trend pieces. I then had the fun of putting lots of outfits together - which is fun as they don't always turn out how I had imagined! In the afternoon I concentrated on evening wear and some tips for the ladies on how to dress themselves slim. I had a great day and learnt so much from the other speakers, who covered personal life coaching and diet and nutrition. We will be doing some more workshops in January and I love them as I get to shop. Lots. In fact I shopped with so much success this week that my credit card was eventually declined. Unlike most people, I love it when that happens as it means that it is time for me to go home. It took a couple of days though (I did go home in between)! Whilst I was at the workshop, one of the ladies came up to me and said "you need to blog more". I was surprised that a) anybody actually read it in the first place and b)even if they did, that they wanted more. So anyway, here I am. I have been a bit lazy on the blogging front of late so it was the kick up the bum that I needed. I just wish my children would react so quickly when I asked them to do something - that way I wouldn't end up unpacking a swimming bag that had sat festering somewhere for in excess of a week. Anyway, when I arrived home, there was a box of shoes from M&S waiting for me. Unlike most people, who like Saturday deliveries, I don't appreciate them at all. How am I meant to hide my purchases if they are delivered on a Saturday in broad daylight - received by my husband and three nosy children who want to know what is inside? So anyway, the point of this post and of the ones over the next few days is to show you what flat shoes are around this season - and these are a flat patent brogue. Now I know that they aren't for everyone, and that they can be quite hard to wear if you don't have the slimmest of ankles but there is no doubt that they are comfortable and smart. If they are for you, they look great with cropped trousers, jeans, or with a dress, as an alternative to ballet pumps. Office does some styles with a bit more of a heel, if you prefer some extra height.